Omg this art is amazing! Neat! Like a combination of Fiona Staples and Greg Tocchini art and colors. whatttt they are really really good! thank you! 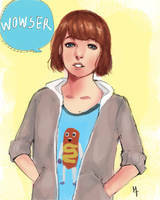 IMO I WOULD BUY THIS YE A.. . . . .
We Are Love All LIS Works!